Earlier this month, we showed you some renders allegedly revealing the metal-clad Microsoft Lumia 850. The images were based on sketches received by tipster OnLeaks, and displayed a rear camera hump similar to the one on the Nexus 5X. Today, a new render of the device was disseminated in a tweet sent by Evan Blass, better known as @evleaks. This time, we get to see what the front of the phone is supposed to look like. The Microsoft Lumia 850, sporting the nickname "Honjo," is expected to carry a 5.7-inch screen with a 1080 x 1920 resolution. That works out to a 386ppi pixel density. Under the hood will be the Snapdragon 617 chipset containing an octa-core CPU and the Adreno 405 GPU. The unit will reportedly measure 6.92mm thin, and will be clad in metal. The Microsoft logo on back looks luxurious in gold, and the handset sports a front-facing flash or an infrared scanner. 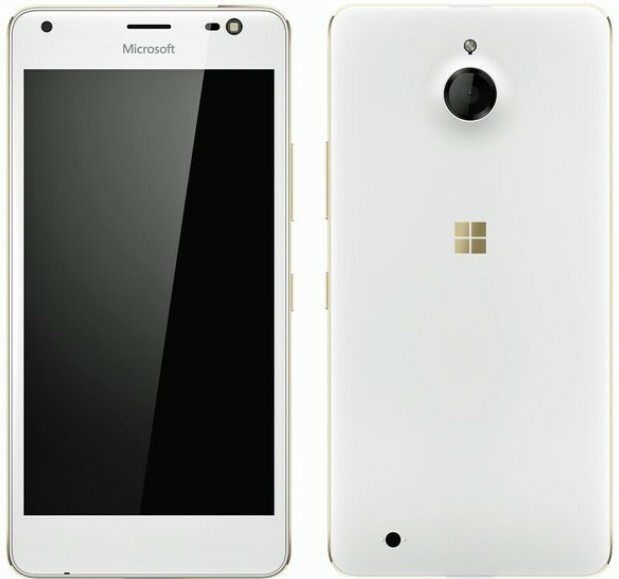 Even though renders of the Lumia 850 have started to appear, there is the possibility that the phone will be canceled by Microsoft. Whether Microsoft decides to unveil the Lumia 850, or takes it out back to be shot, as soon as we get the official word from Redmond we will pass it along to you. No Camera Button and White front panel instead of All Black Front?? MS has gone weired nowadays! And PA, the camera hump is not similar to Nexus 5X but is similar of Lumia 925 and Lumia 1520! Too much bias! Noticed that. One gets the impression like Nexus 5X "invented" the camera hump like that. Trump is playing the card that Andrew Jackson once played. Jackson wasn't part of the elite. So, he appealed to the masses of white males who'd been left out of the political process. He wasn't part of the ivory tower crowd, so he spoke in a way that the masses understood. In today's America, many white masses feel totally left out of the jew-homo elite controlled process. They see Trump as speaking for them. (Trump is a phony I think, but his antics are messing things up, which is good.) Though respectability is good and decent, it is more a style than a substance. A conservative should try to be gentlemanly(when possible), but more important is his conviction. Core conviction is constant. Respectability is a matter of fashion. For example, there was a time when 'gay marriage' was a joke that NO ONE took seriously. No respectable person would have been for it. But today, with jews controlling the cultural fashions, being for 'gay marriage' is very 'respectable' while opposing it makes you 'beyond the pale'. If you favor respectability over conviction, you will be a slave to fashion. Having core convictions means you will remain true to your principles and beliefs EVEN IF they are deemed un-respectable by the current powers-that-be. Respectability is a matter of shifting conventions depending on which group happens to have power over elite institutions and industries. True conservatism is about Core Convictions, not Corrupt Conventions. This was ultimately the problem with Bill Buckley. He was style over substance. He did have core beliefs, but he ultimately favored being respectable over being true to his core convictions. So, he sucked up to jews and didn't take the fight to the homos. He betrayed Sobran and Buchanan. Pat Buchanan is different. Agree or disagree with him, he is that rare conservative with a powerful sense of core convictions, and he will not sell them down the river just to be win respectability points.Control of respectability translates to a lot of power,and jews know this. Their control of media and academia amounts to control of what is respectable and what isn't. As most elites and wanna-be-elites crave respectability, those who control the rules of respectability control the predominant 'values' and agendas of the elites. After all, unless you are deemed 'respectable', the path to success and power will be closed to you. For example, if 'antisemitism' is made un-respectable, then all the elites and wanna-be elites will claim to love jews and condemn any trace of 'antisemitism'. If 'gay marriage' is made respectable, all those who crave power, privilege, and wealth will all praise homos to high heaven.w, conviction and respectability need not be enemies. A people can have both conviction and respectability(if their core convictions are the dominant values of society). But if a conservative must choose between his core conviction and opportunistic respectability, he must choose the former. so......*clears throats* ehh what do you think of the new Lumia here do you like it? What he said is totally related to the article, because Trump and Lumia both has 5 letters. This phone is already cancelled!! Those bezels though... although Microsoft can easily use those bezels for capaciitve keys. It looks as if it has an iris scanner on the front. Seems nice, but 5.7 inch is kind of big for a smartphone. Don't they have a 5-inch version? When will we start to see Nokia branded phones again? As for MS, they're trying to build a user base since they would eventually capitalize on the sale of data from mobile search. They should be providing top spec phones at lowest price possible, at least until their market share is running with the platform leaders.